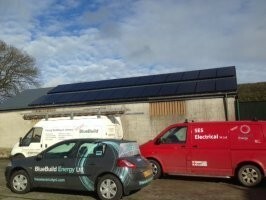 We have had a busy few weeks installing PV Solar systems all across Northern Ireland, but we thought we would share this one. Work was carried out yesterday on this calf barn in Downpatrick. The 6.5Kw PV system using our German Antaris Solar panels will deliver great results for Mr Elliot. Not only will it supply electricity into the farm but, because the panels where purchased, they will also earn Mr Elliot an annual tax free income for 20 years.